The Epiphone Les Paul Standard has a solid Mahogany body and Maple top for the same classic tone that helped to make the Les Paul the world’s most popular solid body electric guitar. All Epiphone Les Pauls (unlike cheap imitations), feature a 14 degree angled headstock that provides more pressure at the nut for longer sustain and better intonation without the hang-ups caused by "string-tree" gadgets. The Mahogany neck has an easy-to-play 60s era SlimTaperTM-D profile with a 24.75” scale length, 22 medium jumbo frets, a Pau Ferro fingerboard with Trapezoid inlays, and a 12” fingerboard radius. 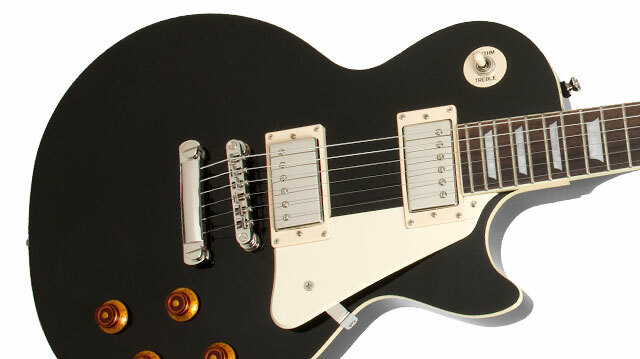 The body and fingerboard have cream binding and the Epiphone “clipped ear” headstock has the Les Paul signature in gold silkprint along with the Epiphone logo in pearloid. The Epiphone Les Paul Standard is available in Ebony, Faded Cherry Sunburst, Metallic Gold, and Pelham Blue color finishes. 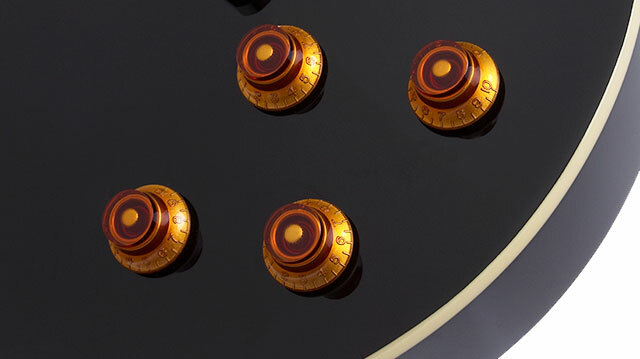 The Epiphone Les Paul Standard is powered by two Alnico Classic™ humbuckers with Alnico-V magnets, which provide a slightly higher output than vintage pickups and also have enhanced mids and highs. Each pickup has a Volume and Tone control with vintage-styled Amber 'Top Hats" knobs plus Epiphone’s all-metal 3-way pickup selector switch. All Epiphone Les Paul Standards feature the nickel LockTone™ Bridge and Stopbar Tailpiece combo that now has an updated patent pending design that auto-locks the bridge and tailpiece in place with no tools needed. 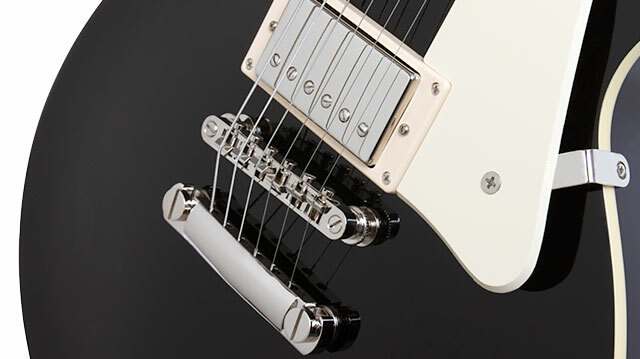 The Les Paul Standard also comes with Epiphone’s proprietary ¼” non-rotating output jack with cream jack plate with an improved contact shape and heavy-duty spring steel. Tuning is fast and accurate with Grover® machine heads with an 18:1 tuning ratio. An optional hard case is available through Authorized Epiphone Dealers. Like every Epiphone, the Les Paul Standard features a Limited Lifetime Warranty backed by world famous 24/7/365 Gibson Customer Service. Visit an Authorized Epiphone Dealer today and add the world’s greatest electric guitar to your collection—the Epiphone Les Paul Standard—to your collection today!